Easter is regarded as one of the most important times of the religious calendar in many places all over the world, and Barcelona is no exception. Celebrations of ‘Semana Santa’, or Holy Week, begin on 14th April and run all the way through to 20th April, providing 8 days of fun activities and traditional festivities for those lucky enough to be in the city during this time. Although many residents choose to escape Barcelona at Easter time and head to the smaller seaside towns and nearby villages, visitors to the city will still be able to enjoy a plethora of Easter parades, processions and, of course, delicious foods . What’s more, the approaching spring weather and less crowded streets make Barcelona an ideal travel destination for an Easter break. Whether you’re looking to get involved in the festivities, or simply explore the sights, including some of the most beautiful churches and cathedrals in the world, you’ll find plenty to do throughout Semana Santa in Barcelona. The city of Barcelona is known to host some fantastic festivals and parties, and while celebrations in other Spanish cities such as Seville hold processions and parades of a larger magnitude, the Easter traditions in Barcelona surely won’t disappoint. 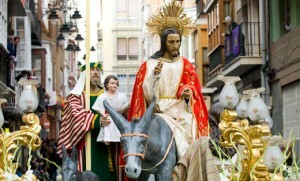 The first parade of the Easter holiday in Barcelona is known as “El Paso de la Borriquita” and takes place on Palm Sunday in the Ciutat Vella, commemorating the arrival of Jesus in Jerusalem on donkey. Throughout this parade, visitors will be able to find stalls lining the streets selling distinctively traditional bleached palm fronds as a procession of floats and costumed participants goes by. After this first live celebration, a week of devotional parades can be seen in the Gothic Quarter of Barcelona and other neighboring towns, as well as on the famous Las Ramblas. 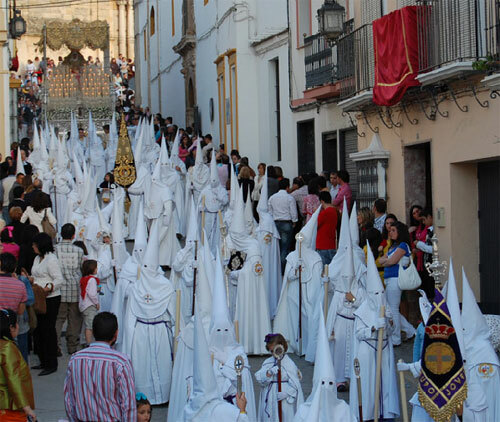 The procession of the Virgin de la Macarena takes place on Good Friday, which falls on 19th April this year. As a general guide make your way to Barcelona Cathedral from 16:00 to 23:00 where there will be processions and activities occurring in the square outside the Cathedral. Whether you are particularly religious or not, these parades will offer an unforgettable cultural experience during Easter. Easter traditions vary throughout different parts of the world, and gift-giving for this holiday in Barcelona is not customary, with one exception: Las Monas de Pascua. These are small cakes, eggs or figurines, which are typically given to children by their godparents. Today, the cakes have many forms, some which include chocolate and marzipan, and all of which are delicious. As Barcelona is a predominantly Catholic city, the tradition of not eating meat on Good Friday is one widely observed by the citizens here. Instead, they choose to follow the Easter tradition of eating fish. 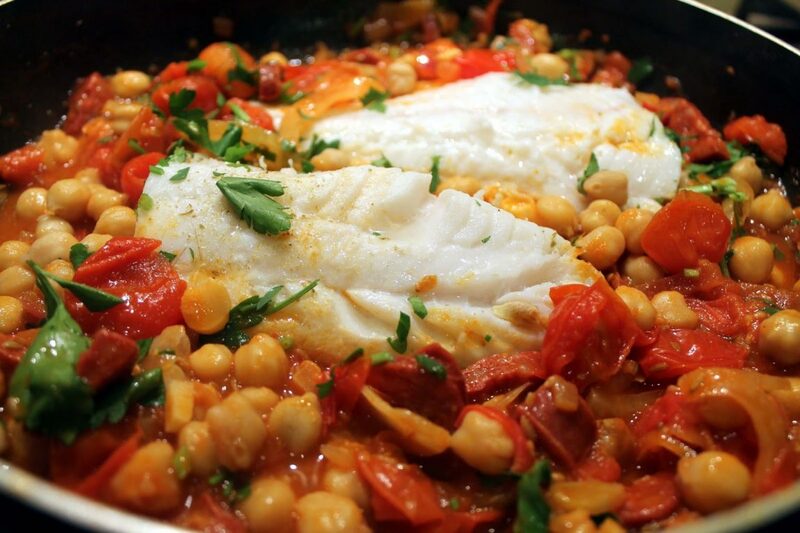 Cod with chickpeas, cod with potatoes and salted cod are all enjoyed throughout the city on Good Friday. Bakeries and ‘chocolaterías’ around Barcelona create the most delectable desserts, too, so Easter Monday is highly anticipated at this time for those who have given up sweets for Lent. 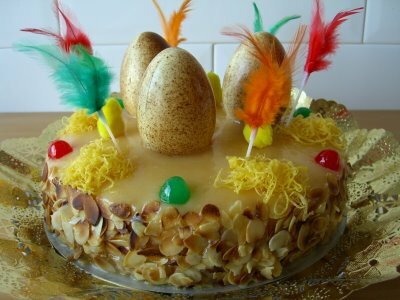 Some of these scrumptious Easter cakes and biscuits include Bunyols, Torrijas, Roscas de Pascua, Pestinos and as mentioned above, the Mona de Pascua. Seville is known for hosting the largest Easter celebrations in Spain, with flamboyant parades, outrageously delicious desserts, and most traditionally, the Nazarenos. But you don’t have to go all the way to Andalucía to sample these customs, as most of them can be found (although to a lesser degree) here in Barcelona, too. Though they’re not a regular feature of Easter everywhere in the city, the hooded penitents named Nazaranos (based on the people of Nazareth) can be found in the celebrations of the L’Hospitalet de Llobregat district of Barcelona. A beautiful sight to see, the Nazarenos sport their distinctively shaped cloaks and masks during parades and processions. 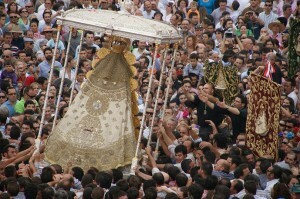 The cone that forms the top portion of the headgear is suggested to be symbolic of the Nazarenos rising to the heavens, providing them penance for their sins. 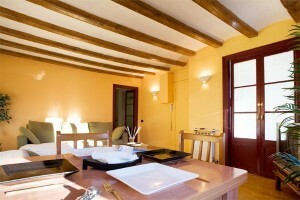 If you choose to rent one of the many Ciutat Vella apartments in Barcelona, whether you opt to stay on the bustling Las Ramblas or the historic Gothic Quarter, you’ll be close to the main parades and processions, plus plenty of top bakeries and restaurants offering delicious Easter cuisine, meaning you wont miss a second of this magical Barcelona celebration. 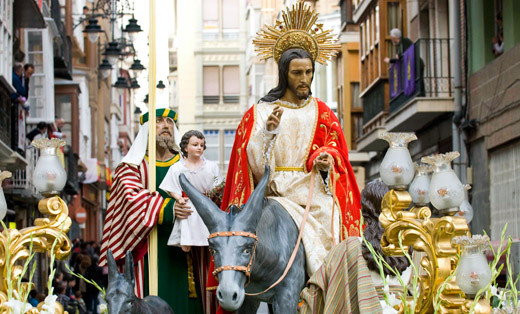 The parades of Semana Santa in Barcelona are an experience you simply cannot get anywhere else, and it would be a sin to skip out on the Easter-related treats on offer in the Catalan capital like the Mona de Pascua. So if you haven’t already, book those flights and a cozy apartment for the week, and enjoy the traditions of Easter in Barcelona!